Many of Robinson Noble’s friends and clients may know Principal Engineer Chuck Couvrette for his work on stormwater management and slope stability. Currently, Chuck is personally inspecting slopes (“Do we really have to climb up that grade?”) and stormwater (“It’s not raining again, is it?”) along the entire West Coast as he and wife Barb ride their bicycles from San Diego to Seattle. 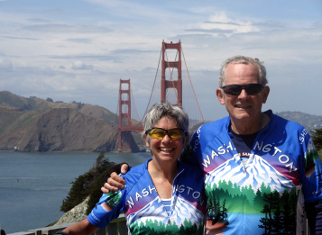 This epic trip, a total distance of over 1,440 miles, is in celebration of their 60th birthdays. The Couvrette’s six-week bicycle trip started on April 23rd. Many broken spokes later, they crossed into Oregon on May 21st. 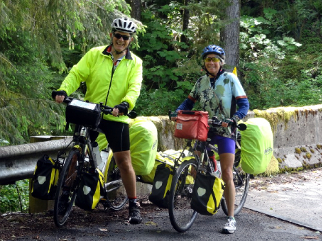 After taking a well-deserved day off in Cannon Beach, they crossed back into Washington today. You can follow Chuck’s epic journey by checking out his blog: http://chuckandbarbcouv.blogspot.com/.